25 oktober 2016 | "It is big and it is clever! 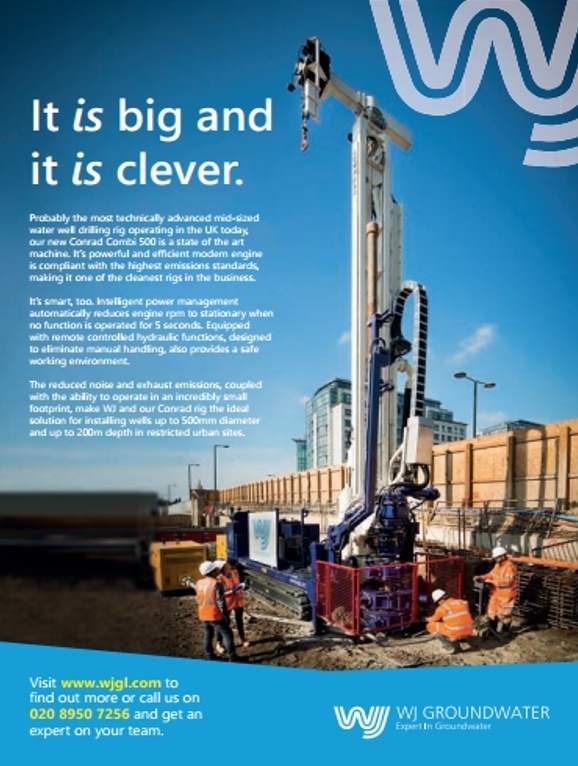 Probably the most technically advanced mid-sized water well drilling rig operating in the UK today, our new Conrad Combi 500 is a state of the art machine." Dat vertelde WJ Groundwater aan GeoDrilling magazine. WJ Groundwater, based in Hertfordshire, UK, has purchased a new Conrad 500 rig from Conrad Stanen. 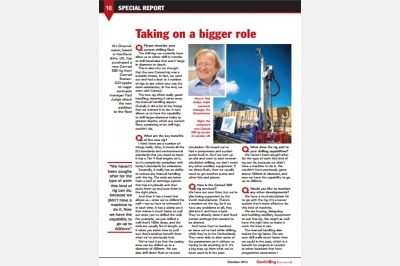 GDI spoke to major contracts manager Paul Judge about the new addition to the fleet. The drill rigs we currently have allow us to either drill in tunnels or drill boreholes that aren’t large in diameter or depth. This is also why we thought that the new Conrad rig was a suitable choice. In fact, we went out and had a look at a number of rigs to see which one was the most satisfactory. In the end, we went with Conrad. The new rig offers really good handling, meaning it takes away the manual handling aspect. Overall, it did a lot of the things that we wanted it to do. 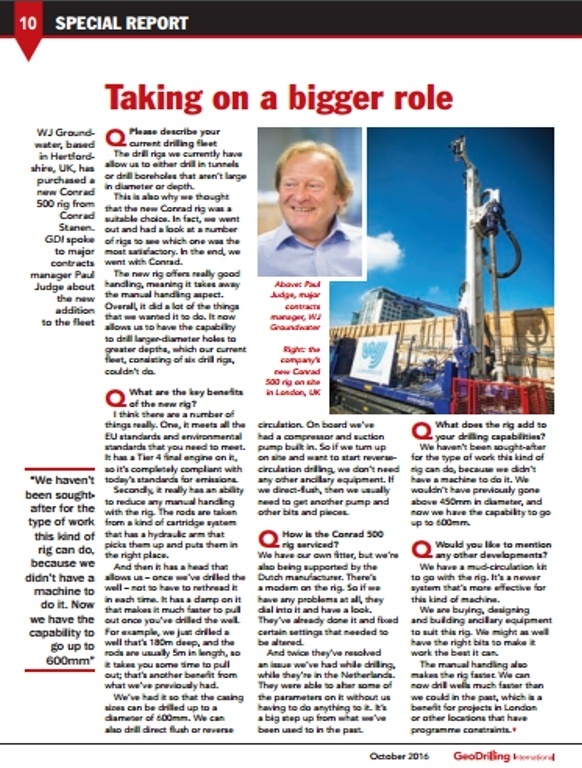 It now allows us to have the capability to drill larger-diameter holes to greater depths, which our current fleet, consisting of six drill rigs, couldn’t do. What are the key benefits of the new rig? I think there are a number of things really. One, it meets all the EU standards and environmental standards that you need to meet. It has a Tier 4 final engine on it, so it’s completely compliant with today’s standards for emissions. Secondly, it really has an ability to reduce any manual handling with the rig. The rods are taken from a kind of cartridge system that has a hydraulic arm that picks them up and puts them in the right place. And then it has a head that allows us – once we’ve drilled the well – not to have to rethread it in each time. It has a clamp on it that makes it much faster to pull out once you’ve drilled the well. For example, we just drilled a well that’s 180m deep, and the rods are usually 5m in length, so it takes you some time to pull out; that’s another benefit from what we’ve previously had. We’ve had it so that the casing sizes can be drilled up to a diameter of 600mm. We can also drill direct flush or reverse circulation. On board we’ve had a compressor and suction pump built in. So if we turn up on site and want to start reversecirculation drilling, we don’t need any other ancillary equipment. If we direct-flush, then we usually need to get another pump and other bits and pieces. How is the Conrad 500 rig serviced? We have our own fitter, but we’re also being supported by the Dutch manufacturer. There’s a modem on the rig. So if we have any problems at all, they dial into it and have a look. They’ve already done it and fixed certain settings that needed to be altered. And twice they’ve resolved an issue we’ve had while drilling, while they’re in the Netherlands. They were able to alter some of the parameters on it without us having to do anything to it. It’s a big step up from what we’ve been used to in the past. What does the rig add to your drilling capabilities? We haven’t been sought-after for the type of work this kind of rig can do, because we didn’t have a machine to do it. We wouldn’t have previously gone above 450mm in diameter, and now we have the capability to go up to 600mm. Would you like to mention any other developments? We have a mud-circulation kit to go with the rig. It’s a newer system that’s more effective for this kind of machine. We are buying, designing and building ancillary equipment to suit this rig. We might as well have the right bits to make it work the best it can. The manual handling also makes the rig faster. We can now drill wells much faster than we could in the past, which is a benefit for projects in London or other locations that have programme constraints. Probably the most technically advanced mid-sized water well drilling rig operating in the UK today, our new Conrad Combi 500 is a state of the art machine. It’s powerful and efficient modern engine is compliant with the highest emissions standards, making it one of the cleanest rigs in the business. It’s smart, too. Intelligent power management automatically reduces engine rpm to stationary when no function is operated for 5 seconds. Equipped with remote controlled hydraulic functions, designed to eliminate manual handling, also provides a safe working environment. 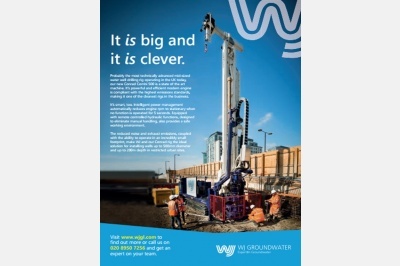 The reduced noise and exhaust emissions, coupled with the ability to operate in an incredibly small footprint, make WJ and our Conrad rig the ideal solution for installing wells up to 500mm diameter and up to 200m depth in restricted urban site. "